This Nova program uses the story of a group of non-athletes who train for the Boston Marathon as the vehicle to introduce a lot of other great material about nutrition and health, the interaction between genetic and environmental influences on fitness and athletic potential, the possibility of changing health behaviors in mid-life, and (perhaps unintentionally) about the ridiculous difficulty of running a marathon. You may find it motivating even if it doesn't make you want to run a marathon in particular. The show features Professor Miriam Nelson, from the Friedman School of Nutrition Science and Policy at Tufts University, in a starring role as both team scientist and inspiration. Dr. Brian Wansink, who was recently interviewed on this blog for his receipt of the Ig Nobel prize, was appointed Executive Director of the USDA's Center for Nutrition Policy and Promotion (CNPP) last Wednesday. At CNPP Dr. Wansink will be responsible for overseeing the planning, development and review of the 2010 Dietary Guidelines for Americans, the food pyramid known as MyPyramid.gov and programs including the Healthy Eating Index, the USDA Food Plans, the Nutrient Content of the U.S. Food Supply, and the cost of raising a child. Praise comes from Marion Nestle, the Ethicurean and Eating Liberally for USDA's appointment of a university researcher, as opposed to recent appointments that have come directly from various industry positions. Wansink's novel research on home and restaurant environmental triggers for unhealthy eating and overeating informs his book Mindless Eating: Why We Eat More Than We Think- about how to modify immediate environments in order to change nutrition behavior, without creating new regulations or directly attacking individual behavior. Economics webloggers such as Tyler Cowen and Mark Thoma are covering Nathan Berg's argument that low-income neighborhoods lack good grocery stores because grocery executives don't happen to know those neighborhoods well. But, before we move on to diagnosis, can we ask first just how ill the patient is? Some of the best research I know on this topic comes from various USDA surveys of Food Stamp Program participants and low-income nonparticipants. For example, Ohls and colleagues (.pdf) reported in 1999 that one third of low-income respondents shop within a mile of their home and another third within one to four miles. Ninety percent use supermarkets as their major source for food shopping. Almost two thirds reported that their round trip to a grocery store required less than 30 minutes of travel time, and another quarter required between 30 minutes and an hour. In low-income neighborhoods of the East Coast cities I know best, food retail has improved since this report came out. How can we square the USDA data on the moderately agreeable retail experience of a typical food stamp participant or low-income family with the widespread concern about food deserts in low-income urban neighborhoods? Consider first the low-income urban food desert you know best (I'll hold Anacostia in DC, or eastern Baltimore, or South Bronx in my thoughts). Then, ask yourself what fraction of low income people in the corresponding metro area live there. For example, here's a map of DC from USDA's Economic Research Service around 2000. Consider not just Anacostia, but also the low-income neighborhoods with good retail. Dark green is highest poverty, and dots are grocery stores. Likewise, fiddle around with this wonderful interactive GIS map from the New York City Coalition Against Hunger last year. Think both about what particular neighborhoods have the worst retail (it's pretty bad), and also about what fraction of low-income New Yorkers probably have pretty good retail access. I don't recommend writing off the most desolate neighborhoods, but fixing retail in those neighborhoods should be part of broader anti-poverty strategies. Certainly, a low-income New Yorker has other things to worry about besides this! Good empirical work on the scale of the problem is important for clear thinking about policy remedies. I worry, for example, about tax giveaways to supermarket chains, at least without some hard consideration of other policy options -- including those that give a greater role to healthy food sales from smaller store formats. The U.S. Department of Agriculture reported today that 10.9% of U.S. households were food insecure in 2006. This measure of hardship is essentially unchanged from the previous year. Food insecurity is determined from a survey battery of 18 questions about food-related hardships. About 50,000 randomly selected households around the country respond to the survey each year. Those households who answer affirmatively to 3 or more of the 18 survey items are classified as "food insecure." 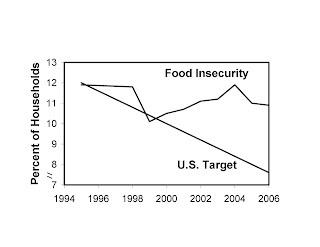 Rates of food insecurity decreased from 11.9% in 1995, when national data collection began, to a low of 10.1% in 1999. Food insecurity worsened in the current decade, reaching 11.9% in 2004. Despite several recent years of economic expansion, rates of food insecurity remain high. The benefits of economic growth have not been reaching those Americans at greatest risk of food insecurity. USDA reported today that the rate of "very low food security" was 4.0%, which is no better than the rate of 3.9% for the preceding year. USDA formerly described this level of hardship as "food insecurity with hunger," but the terminology was changed last year in response to disagreements over the appropriate official meaning of the term "hunger." The lack of progress in the new report, authored by Mark Nord, Margaret Andrews, and Steven Carlson, contrasts with the federal government's national objectives for reducing food insecurity (see my illustration below based on USDA data). In another previous goal-setting effort, the USDA Strategic Plan for 2002-2007 proposed that food insecurity with hunger among low-income Americans (with income below 130% of the poverty line) should be reduced to 7.4% by 2007. The corresponding figure for very low food security among low-income Americans in the most recent USDA data is much worse at 13.1%. It appears unlikely that the goals of USDA's Strategic Plan will be met. It is Canada’s view that when trade-distorting domestic support is properly accounted for under the WTO Agreement on Agriculture, the United States exceeded its WTO commitment in 1999, 2000, 2001, 2002, 2004 and 2005. Canada’s concerns are shared by Brazil. Brazil is also announcing today that it is requesting a WTO dispute settlement panel on U.S. agricultural subsidies. Canada and Brazil have been working together to coordinate their challenges. Given the similarities, it is expected that their cases will be heard by a single panel. The United States has agreed to report to the WTO the amount of its farm subsidies that is "trade-distorting." For example, a trade-distorting subsidy encourages farmers here to produce more than they otherwise would produce, which can lower the world price for a commodity and harm the interests of farmers in other countries. The United States has traditionally excluded some farm programs from these reports to the WTO. For example, our "direct payments" are several billion dollars worth of government checks to farmers who produced a crop at some previous point in history, regardless of whether they currently produce that crop. Brazil and Canada have pointed out that these "direct payments" are still trade-distorting, because U.S. rules prevent our farmers from growing fruits and vegetables if they receive these direct payments. One upshot of the new Canadian complaint may be to increase pressure on the United States to stop restricting fruit and vegetable production. An end to these restrictions could save the United States grief in trade negotiations and at the same time make fruits and vegetables more affordable, especially for low-income Americans. Here is the AP report about Canada's announcement. I first read the news at FarmPolicy. After several years of refusing to respond to consumer requests for nutrition facts information, the Quiznos restaurant chain recently began posting such information on the corporate website. Until now, Quiznos was the largest national restaurant chain that would not share nutrition facts information for most of its products online or in response to consumer queries. It is not clear exactly when the nutrition facts were first posted. Apparently, this news has not been reported elsewhere yet. 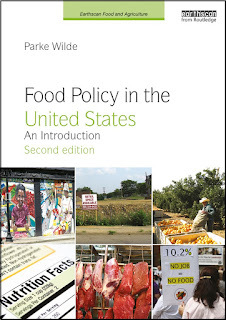 I first read about it from a comment yesterday on U.S. Food Policy (thanks Melissa!). The federal government's Food and Drug Administration (FDA) encourages restaurants to post nutrition information on a voluntary basis, but federal rules do not require such disclosure. Yet, the federal government's beef checkoff advertising program -- sponsors of the "beef check" symbol and the slogan "Beef. 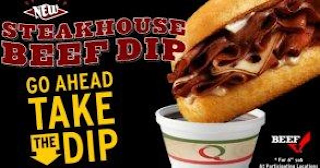 It's What's for Dinner" -- has participated in at least two partnerships with Quiznos to promote high-calorie high-fat beef sandwiches. My efforts to request more information about these promotions from USDA, the Beef Board, and Quiznos have been stonewalled in the past. To find this information on the Quiznos website, one must go to the company's menu page, then click on a small link at the bottom to "Show Nutrition Information," then click on a particular product, then click on "large," and then click the two selection boxes for the sauces (even though I have been served the sauces as standard parts of the sandwich... oops, did I just admit eating there? ... well, it was part of this investigation). A rule proposed in New York City would require chain restaurants to post calorie information on menu boards. After a court challenge from restaurants, this proposal is currently under revision and may yet be put into practice. In a sensible effort to avoid burdening independent restaurants and even small chains, the new rule was at first designed to apply only to restaurants who already share nutrition facts information for their standardized products. Reporters covering this controversy had commented on the fact that, paradoxically, this effort might allow a chain like Quiznos to avoid the impact of the new rule. A revised version of the New York City rule would more clearly apply to Quiznos along with other chain restaurants. Update 11/9/2007: See also the news coverage and additional data at Fast Food News. In the House of Representatives this summer, Speaker Nancy Pelosi (D-CA) supported the non-reform bill from the Agriculture Committee, calculating that the political gain from trying to purchase political support in marginal Democratic districts in the heartland outweighed the loss from failing to stand up for good government. After all, how many people outside of farm districts pay attention the Farm Bill anyway? Well, perhaps more people than you think. To a greater extent than I ever recall in previous Farm Bills, the public is paying attention now, just in time for the Farm Bill debate on the floor of the Senate. Consider Michael Grunwald's lengthy article in that obscure trade weekly, Time Magazine. He says that "if you eat, drink, or pay taxes," you should think of the Farm Bill as a big deal. It's also a horrible deal. It redistributes our taxes to millionaire farmers as well as to millionaire "farmers" like David Letterman, David Rockefeller and the owners of the Utah Jazz. It contributes to our obesity and illegal-immigration epidemics and to our water and energy shortages. It helps degrade rivers, deplete aquifers, eliminate grasslands, concentrate food-processing conglomerates and inundate our fast-food nation with high-fructose corn syrup. Our farm policy is supposed to save small farmers and small towns. Instead it fuels the expansion of industrial megafarms and the depopulation of rural America. It hurts Third World farmers, violates international trade deals and paralyzes our efforts to open foreign markets to the nonagricultural goods and services that make up the remaining 99% of our economy. I hope the Senate is paying attention to the fact that the public is paying attention. Economists use the term "credence attributes" to describe qualities that the food consumer must take on trust, because it is impossible to verify by inspecting the product in the grocery store. For example, the consumer must trust that the organic label truly reflects adherence to a certain set of standards about production processes and chemical inputs. (Washington, D.C.) – Today, the Government Accountability Project (GAP) requested that the United States Department of Agriculture’s National Organic Program (NOP) initiate an investigation into violations of organic standards allegedly committed by a mushroom production company based in California. A formal complaint from GAP was submitted earlier today against Golden Gourmet Mushrooms, Inc. (GGM) of San Diego County. -- Making false claims regarding the nature and origin of its mushroom products. A copy of the complaint can be viewed on GAP’s Web site (.pdf). GAP urges the NOP to immediately begin investigating GGM’s alleged violations of the organic standards and whether its supplier, Japan’s Hokuto Corporation (Hokuto), participated in fraudulent practices. GAP further asks the NOP to review the performance of private organic certifier Quality Assurance International (QAI) to determine if it is capable of and intent on fulfilling its obligations as a certifying agent. “Every violation of the standards reduces public confidence in the organic label. It is critical that the National Organic Program thoroughly investigate complaints and weed out any bad actors now while the program is still young,” says Jacqueline Ostfeld, GAP Food and Drug Safety Officer. Congress has earmarked more than $11 million dollars so far for the building and hundreds of thousands more for research. That’s not to be confused with the $2.6 million they've earmarked to study grapes out in California. It's not as if Uncle Sam wasn't already investing millions a year in grape research: there are 25 full-time federal scientists working on nothing but grapes. The special earmarks are tax dollars added on top of that by individual members of Congress. A “CBS Evening News with Katie Couric” story is shocked, shocked! to learn that $11 million of “your tax dollars” have been allocated to conduct research on wine grapes including a $2.6 million research facility at Cornell. But they have it wrong: it’s not shockingly bad news, it’s new news. And it’s good news. Ever since the repeal of Prohibition, the federal government has been reluctant to fund grape research. In fact, in the 1930s, after Repeal, FDR’s Department of Agriculture proposed a wine research facility to be funded with federal funds and help the industry get back on its feet. However, an influential Dry congressman unilaterally vetoed the project wanting to prevent the evil “fermentation.” Since then the federal government has been reluctant to fund wine grape research. So this $11 million should be seen as a real breakthrough, evidence that the federal government is actually doing something to support wine. What is in the federal government's dairy advertising report? USDA's Agricultural Marketing Service (AMS) is required to give a report to Congress each July, explaining the activities and budget of the federal government's fluid milk and dairy checkoff advertising programs, sponsors of the "Got Milk?" slogan, the "Milk Mustache" ads, and the "Real Seal." Last year's report, which was finally made public in October 2006, emphasized the government advertising program's use of dairy weight loss claims, which are controversial in nutrition science circles and are not consistent with the government's own Dietary Guidelines for Americans. The weight loss claims were especially odd when set against the dairy programs' heavy promotion of high-fat cheese through marketing collaborations with restaurants such as Pizza Hut. Just a few months later, the Federal Trade Commission contacted USDA to raise questions about this advertising message, and USDA agreed to discontinue the high-calcium weight loss marketing. The campaigns have many other good messages they could use instead, such as the possible role of low-fat dairy in protecting against weak bones, but their marketing research had shown consumers to be especially responsive to weight loss messages. It will be interesting to read how AMS describes these developments in the July 2007 report. While July is long past, the report is not yet being shared with the public. AMS folks tell me it is "still in Departmental clearances." Most Food Stamp Program families operate on a sharp monthly food spending cycle. The greater part of food stamp benefits are spent within a few days of being credited to the EBT card, the debit-style card used by the program to issue benefits. Colleagues and I have written about this cycle in articles for the American Journal of Agricultural Economics (2000) and Journal of Consumer Affairs (2001). At the same time, many food stamp families report food insecurity and hunger at some times of the month, generally near the end of the food stamp cycle. For a couple years, I have been following the progress of a proposal in Michigan to have benefits issued twice a month, which might help families budget more smoothly over the course of the month, perhaps leading to healthier choices and less hardship in the second half of the month. See coverage in the New York Times and NPR. The twice-monthly distribution is similar to what happens when your 401k plan adopts adequate levels of savings as the default option, but still allows you to opt for lower savings if you desire. Research suggests that many workers will accept the wiser default savings position. Similarly, with food stamp distribution, a family that prefers to shop once monthly is still welcome to do so, on the occasion of the second benefit credit each month. The twice monthly benefit delivery does not force people to shop twice monthly. If needed to keep some participants from being inconvenienced, one could even allow a more formal "opt out" mechanism, which would allow people to receive traditional once monthly benefit delivery on request. My own hunch is that many participants would like the new twice-monthly delivery schedule. Advocates for the Michigan proposal, including grocers who would like to spread their sales more efficiently over the month, think they may be nearing success in the Michigan state legislature. Yet, they fear their efforts may be overturned by the U.S. Senate, which is reported to be considering language that would forbid twice-monthly benefit issuance. I haven't been able to track down the exact language of concern in the Senate's Farm Bill under debate. It seems twice-monthly benefit delivery should be considered, at least on a pilot basis. Certainly, it seems like a bad idea to cut off exploring this program innovation by federal fiat. Update 11/6/2007: A reader sends the relevant text, which is available in section 4203 of the bill on the Senate agriculture committee's site: "MULTIPLE ISSUANCES.--The procedure may include issuing benefits to a household in more than 1 issuance only when a benefit correction is necessary." Thanks!